I have heard about Alyeska for years since my aunt and uncle and their family have spent some time here, so when airline prices went up, up, up, our vacation to Colorado got shelved in favor of something closer to home. Doug and the kids had never downhill skied or snowboarded before, but the kids were enthusiastic about a ski vacation, so we set up a 4-day trip to Alyeska. Alyeska is located in Girdwood, which is about 30 minutes south of Anchorage on the Turnagain Arm off Cook Inlet. The top of the mountain, at 3,939 feet, gets 635 inches of snow each year, while the base gets, on average, 197 inches. We are used to having more snow where we live east of Homer than just about anywhere else we visit on the Kenai Peninsula, but they do have more snow in Girdwood than we do at home, and it felt like a truly beautiful fairyland driving the streets of the village, with lamplight shining on snow-laden spruce trees and the snowbanks piled high. Day 1: Douglas and Aurora took snowboarding lessons, Denver took alpine lessons, and I bopped around and got a feel for the lay of things. I have my own skis that a friend gave me (thanks, Lorraine! ), and my lift tickets came with the room, so I was free to ski all I wanted. It had been 18 years almost to the day that I last downhill skied in Colorado at Keystone, but the snowplow turn felt like second nature despite all those years. I was still a bit tentative on the green (easy) slopes, but enjoyed the long, gradual Blueberry Hill and Sitzmark runs. After a couple runs, I decided to take the tram to the top of Mt. Alyeska. It was a cloudy, overcast day, but just a few hundred feet up we went through the clouds and broke out into the glorious sunshine which you see in the picture above. It was a different world up there, and though Turnagain Arm was covered with clouds, the mountains all around the Arm soared up, creating a stunning vista. It is above treeline, so it was all snow, snow and more snow. It made me kind of nervous thinking about skiing down it since I could see just how far I had to go. I was used to Keystone (the only other place I'd ever downhill skied), where it was 4 miles from the top to bottom and there were plenty of trees to break things up. I took the tram back down, feeling slightly embarrassed to be carrying my skis back down the mountain rather than skiing it. Day 2: Douglas and Aurora took the Level II snowboarding lessons, and Denver and I hit the easy slopes. After 2 runs down, Denver beat me to the bottom every single time. Picture what the alpine ski racers look like, crouched down in a tuck and on a single-minded focus to get to the bottom of that mountain as fast as possible. That's exactly what Denver looked like in his cute blue snowsuit that is patched up with duct tape. "No fear" comes to mind as I watched him, and my mother instincts on one hand wanted to yell at him "Stay in control!" every single run, while on the other hand I wanted him to feel the confidence and joy of skiing well, which he was. Three hours of skiing tuckered us out so we were ready to hit the hot tub. Meanwhile, Aurora and Douglas learned the "S" turn on their snowboards, each of them at one of the two "Magic Carpets"--conveyor belts that take beginning skiers and snowboarders to the top of their practice area. Day 3: Douglas and Aurora practiced their snowboarding technique for a couple hours. In the afternoon I took Aurora down the Blueberry Hill run, and was totally impressed by how well she did. Day 1 saw her falling a lot, but she managed a decent sized hill 2 out of 4 times without falling. Again, my mother instincts were to be protective and "Oh my gosh, she's going to fall!" but Aurora popped right back up again and on she went. Since I know nothing about snowboarding, all I would be able to do is help her up anyways, so I was really hoping she knew what she was doing. I am in awe of that girl, though! Douglas didn't feel like attempting a bigger hill on his board, so he watched each of the kids as I took the other out. Denver was a kamikaze skier again today. More awe on my part. Never mind that he's only skied a couple times--I was learning from him! He has naturally great technique and got the telemark turn down pat. How does he manage to be so good? I am jealous! I think part of it is just that lack of fear that I once had--and that got me in plenty of scrapes. The big accomplishment of the day was by ME! I took the tram up to the top first thing when the slopes opened at 10:30, determined to ski down. There is a blue star route--one level above the green easy slopes--that goes from the tram on down to the bottom. Since I learned to ski when my boyfriend at the time took me to the top of Keystone and said, "Ski down," I figured that I should be able to ski an easy slope. I hardly got a wink of sleep last night I was so keyed up about it. It was one of those things I wanted to do simply because I feared doing it. I am a firm believer in "Feel the fear and do it anyways." So, I felt the fear and did it anyways, and I am here writing about it, so I obviously survived! There were a few major challenges for me on this run down Main Street, The Weir, Ego Flats, Cork Screw, Switchback, Klondike and Cabbage Patch. First of all, I was the first one down the slope that day! All the other people who had gotten out of the tram took the more difficult runs, so here I was, trying to figure out where the runs went in fresh, ungroomed snow. It would be one thing if I were an experienced skier, but I am not. When I last skied I was with someone who told me where to go, what to do, etc. I just had to ski. This time I was all by myself with no one to guide me. In one place I followed the sign that said "Switchback", but it appeared to be pointing in a narrow trail through the woods. That didn't seem right, so I skied back out of the woods, and further down I saw my turn. My second challenge was that my legs got incredibly tired. I was using way more energy than one needs to, partly because I was so tense and partly because my technique was terrible. So by the time I got down to the Klondike, my quads were shaking from fatigue, and the final run, the Cabbage Patch, was the steepest part of the whole run. Well, I made it down to the Day Lodge in 17 minutes from the time I started, and let me tell you, it was the longest 17 minutes I've been through in quite awhile. Denver was raring to go when I finally found him, so I managed another 3 hours of skiing for him before I begged off to head to the hot tub. There were no lines at the lifts, the slopes weren't very crowded, the weather was perfect, the staff were nice, and besides Chair #3 on the easy slopes breaking down for an hour on Day 2 (very frustrating for Denver), it was a good skiing/boarding experience. Aurora is now plotting how she can earn money to buy a snowboard, and Doug thinks he'll actually "ride" again sometime. Alyeska Resort is at the base of the tram and Chair #7 which takes one over to the main slopes. The beds and pillows are immensely comfortable, which is not something to take lightly! The hot tub is delightfully huge, and the pool is nice. There is a beautiful, posh exercise room which I was too tired to check out, but which tempted me each day. The greatest disappointment was that the resort advertises a skating pond right outside, but they weren't maintaining it, so we'd hauled our ice skates here for naught. There are also cross-country ski and snowshoeing trails all around (50 kilometers worth! ), but again, I was too tired after skiing the slopes to torture myself like that! Overall, this was a nice, comfortable vacation, and was less than the price of 2 plane tickets to the Lower 48. We were each happy with what we did, and we're already trying to figure out when we're going to come back again. Huh? You ask. Am I playing too much raquetball, or skiing till I drop? Nope. Let me explain. As the days have been growing darker and darker and our daylight has dwindled to about 6 hours, I have been cruising along happily, so impressed with how well I was dealing with it. "Gee, what's the big deal about it being dark in Alaska? No problem." I've even considered blogging about how much I like the darkness: it is comforting like a blanket in a way, surrounding me. Well, last week I "hit the wall." The lack of light finally started to bug me--really bug me. It might have been the rain we had last week. The roads were icy, icy, icy and the snow wasn't that great for skiing. I got to the gym most days and ate pretty well--just a handful of potato chips each night. But I didn't spend any time outside, and I think that's what did me in. I blogged about the lack of sunlight last year, but I think it may be something I revisit each year--as many Alaskans do. Everyone is affected, though some more than others. Even people who have lived here all their lives notice it. A key factor is sunshine. The sun has been hiding for weeks it seems, besides the weak (though beautiful) light of sunrises or sunsets. I recall noticing the darkness in Marquette, Michigan one winter (and moved to Arizona after that winter!!) simply because the sun never came out. The lack of light is not just an issue in Alaska; many people in the Lower 48 deal with it as well, as I did that one winter in Michigan. But it is more pronounced here--and in some places in Alaska much more than others. What "hitting the wall"has reminded me is that I really have to take care of myself...and I really need to get outside to catch what rays there might be. 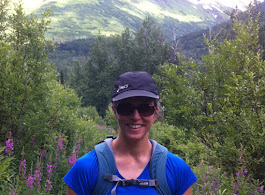 It takes a conscious effort to stay sane and stay happy in Alaska, but it can be done. This was my wake-up call! As one leaves Homer and heads down East End Road, the world changes from that of cityscape to that of glorious panarama. Even after a year and a half of driving the 20 miles to town, I still notice and feel the transition to another world as the road climbs higher, narrows and winds around canyons. If you go far enough, the narrow, frost-heaved road turns to gravel and you enter the Russian village of Voznesenka. And if you are daring and continue on, the road narrows even more down what the locals call "the switchbacks" which lead to the "Head of the Bay"--the mud flats at the head of Kachemak Bay. 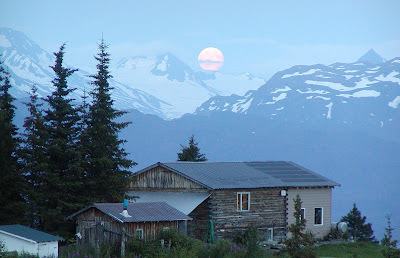 If you were to make your way past a no tresspassing sign up that way, you might feel transported to another country as you en ter Kachemak Selo, one of the trio of Russian villages at the Head of the Bay. The dirt lanes and fences separate homes, children play in the dirt and 4-wheelers roar by. Most days we drive the relatively tame but still beautiful East End Road out of Homer. The sense of neighborliness and courtesy on the road is not dead. When I get behind a slower-moving car, I sigh and sink into my seat and remind myself to enjoy the scenery (if it's light out!). Yet just a day ago two cars pulled off and let me pass--just me, and no other cars behind me. This is not an uncommon courtesy; it seems to happen at least once a week . It still startles me. Yet when I am the one going slower, I will pull off as well--following the example of my courteous n eighbors on East End Road. My favorite pasttime while driving East End Road is to pull out my camera and take pictures of the awesome beauty! Needless to say, this is a dangerous enterprise since I'm usually driving, or I stop in the middle of the road. When the section of road you see here is covered with snow or ice, it quickly becomes treacherous. But I am irresistibly drawn to take pictures so I can share the changing moods of Kachemak Bay, the Kenai Mountain Range, the glaciers. Just over these mountains is the Harding Icefield, the largest icefield entirely in the U.S. I dream of flying over it, of hiking it, of exploring it as I drive this road. If you Google "East End Road Homer Alaska", you will learn of homes for sale and of local murders. But there is much more to this road than can be summed up in a map. Locals like to tell stories of only 10 years ago when the paved road ended at McNeil Canyon School at Mile 12, and one had to take a 4-wheeler or snowmobile to the villages. Now the pavement extends all the way to Mile 20 or so. The road was inaccessible--or nearly so--in the spring with the frost heaves. The grandfather of our landlord helped build this road. The father of our landlord drove down the mud flats to Homer once a year to get supplies--the only time they would get to town. I find a mystique in driving East End Road. We have been contemplating "moving to town," but the thought hurts each of us in a different way. I would miss a 30+ minute commute over--I will say it--one of the most beautiful places on earth. I don't say that lightly. There are many glorious places on this earth, but something about the Homer area has lodged itself inside us like a shard of glass--or a magnet. Even if we leave, it will always be there, drawing us back. This unassuming building holds a quality of life issue for us: the Boys & Girls Club of Homer provides after-school care for kids every school day plus summers for only $20 per child per year. It is the old middle school, and has an art/music room, computer lab, homework corner, gym and kitchen. Staff plan activities in each of the areas daily. And each day they serve a substantial snack to the 30-50 (a very rough guess!) kids that visit. Quality after school care is an important consideration for people who work, and we feel very blessed to have a "B&G" in Homer. Our kids ride the bus 14 miles from their elementary school in Fritz Creek into town (free--it's part of the route), and can have fun running around the gym, doing homework, chatting with friends or whatever suits their fancy till 6 p.m. It is a relief for us to have someplace our kids can go when we're working or in meetings. Plus, having them get a ride into town from school is an added benefit. The Borough owns this building and wants to sell it to Kachemak Bay Campus for $1 (the college holds classes upstairs). However, the problem is that it is an old building with asbestos, and some major repairs are needed. No one wants to take over a potential money drain like this. Burning the place down for fire crew practice has even been considered (after the abestos has been removed, of course). It is a dilemma, and it sure makes me wonder what's going to happen to all the kids who come here. Many parents cannot (or would not care to) afford child care, daycare providers are scarce, there are not many alternate buildings for the B&G to occupy, and budget cuts have already cut the hours provided. Despite these woes, the B&G's doors stay open, and we fully appreciate each time our kids have a safe, fun, comfortable place to go after school. Having a Boys & Girls Club in Homer has definitely added to the quality of our lives here, and we certainly hope it will continue to be able to provide this valuable service. I have always kind of pooh-poohed those who go ga-ga over sunsets (boy, that sounds really juvenile. I can't believe I wrote that, but I'm going to let it stand. ), but the past few weeks have offered sunset after sunset that I have just sighed and gone "Woooooooow." Santa came early to our home last week when Douglas returned from Anchorage, and the new camera (to replace the one we lost while hiking in Kenai in August) is quite portable, so I took it out with me as I skiied, sledded and drove around this week. Enjoy a couple of shots. We're all relieved that gas prices are going down (besides the oil moguls), but now the injustice of it all seems to hit. Gas prices were 35 cents per gallon lower in Anchorage than Homer last week, and from what I hear prices are at least a dollar per gallon lower in the Lower 48. Considering we get our fuel from an oil refinery just up Cook Inlet (Nikiski), it seems like our fuel prices ought to be lower than elsewhere. It's a quick boat ride from Nikiski to Homer, while most states in the U.S. don't even have a refinery in state. Rumblings are that Tesoro is recouping losses elsewhere by keeping Alaska gas prices abnormally high. In most places in the state (Anchorage excluded), Tesoro is the only gas station available. That monopoly allows them to charge what they like for gas, and we have to take it since we have no choice. Obviously, the competition in Anchorage has driven prices down to a somewhat less inflated cost. So while I am delighted gas is no longer $5.00 gallon (it was pretty darn close, but I stopped looking after it hit $4.50/gallon), of course $2/gallon would be much easier on my wallet! To all those down yonder: count your blessings! If anyone had told me I would be writing about becoming a good cook 25 years ago when I chose woodworking class instead of home economics in middle school, I would have thought them completely crazy. I was the person who ate ramen noodles raw (uncooked!) because I was too lazy to cook them. I now live in rural Alaska where one needs to cook if one is to be healthy and not spend a fortune on processed food from the store. Here is my journey to this point where I now consider cooking one of my hobbies, and what role living in Alaska has played in that transformation. "You're a good cook!" is a phrase I now hear regularly when people come to visit and I get to feed them, but it is a title that I am uncomfortable with. It doesn't quite fit how I see myself, though it is definitely something I want to be. I guess if enough people tell me that, I might start believing them. However, it comes down to one's taste, and that is one of the first things I have learned. When I look through recipe books now, I no longer assume that just because someone else says something is divine that our family will find it so. In fact, I find some cookbooks next to useless because they are filled with things that we would not like, or even if we would like, I do not care to prepare. I always thought the problem was me, but my growing awareness of and experiments with food have taught me that there are just some foods that do not appeal to our taste buds. Rather than being upset with my family for not liking a food, I make note in the cookbook and do not make it again, moving on to another recipe that we might like. A few things set me on the trajectory of cooking more. The first was a well-supplied kitchen. I will admit it, I am cheap. The pots and pans in our kitchen are all wedding presents from 15 years ago or hand-me-downs from someone else's kitchen. We invest in a cheap teflon frypan every year or two, and that has been the extent of acquiring anything in the kitchen. When we moved to Alaska we lived with the people we were renting from for 2 1/2 months. Along with seeing someone else cook, I inherited their kitchen supplies. It was an eye-opener for me to realize how useful some things could be. For example, a wire rack is called for in cooling baked goods. I doubt I ever would have bought a wire rack for myself, but now I find myself pulling it out several days a week! Or how about the joy of drinking from glass glasses instead of plastic cups covered with scratches and cracks? Juice tastes clearer and colder when drunk from glass, and is worth it for the pleasure it brings. Serving dishes and serving spoons always seemed excessive wastes to me: "Plop the pot down on the table and eat up" was my attitude. But again, I feel better about eating and enjoy the experience when it is nicely arranged, so I began to use the serving dishes our landlord had in their cupboards. Filling our freezer with meat--moose, beef, salmon, halibut & clams--was the next impulsion to learn to cook better. I doubt I'd cooked more than one steak in my whole life before coming to Alaska. Ground beef and boneless, skinless chicken breasts were my forte. Being given all this meat meant I had to cook it! Google saved me! Every time I pulled a package of meat out of the freezer I would run to my computer and figure out what to do with it! Brisket, t-bone, top sirloin, roasts were all strange words to me. Marinade?? Rub?? Huh? It has been a learning curve trying out different recipes to find what we like--and what cooks the way the recipes says it should! I have always been the type who wanted my meat charred or I wouldn't touch it. I have discovered that meat is better with a little pink inside, and I've coached my hubby in grilling it right so that it is more edible--actually, a delight--to eat. I regularly use my herbs and spices now...and use them up! Just a year ago I didn't even use them, much less how to! The desire to be healthy was the next impetus to learning to cook. My aunt and cousins are health food fanatics, as are a number of other people I have met up here, so it has provided a community of sorts to learn about how to eat good food. I have a hard time picturing eating in Michigan the way we eat here. It just doesn't fit somehow. Up here, it is not unusual to eat the product of a hunt, dig clams, fish, pick berries and all the other subsistence living activities that make for healthy eating. It is much more deliberate and conscious here: the more we put away, the healthier we will be. We barely touch the surface of subsistence living (it takes time, skill and special tools), yet we are part of the history of this place--the roots of life in Alaska--when we put things away for the winter. And we are all so conscious of the food we put into our bodies now. My husband, a lifetime McDonald's and soda addict, has given up both of those--a miracle I never thought I would live to see. We belong to an organic food co-op to take advantage of organic food at lower-than-local prices. Living in Alaska has changed the way we see and experience food. The sometimes outrageous prices for food has led us to seek more economical means of feeding our family. Anchorage food prices are comparable to the Lower 48, but as you head south on the Kenai Peninsula, prices get more expensive. The same item in Homer could cost $1-$6 more than in Soldotna to the north. Buying in bulk has become a way of life to make up for the long periods between trips to Anchorage, so we learn to cook and eat what we have, becoming creative as we run out of things and anticipate the next trip to Costco. A week ago, all our meat was nearly gone (2 steaks and some ground moose left in the freezer!). We kept holding off getting groceries, knowing my husband was going to be in Anchorage this week to re-supply. It will be such a relief when he returns with the Durango loaded with food to last us till the next trip to Anchorage. The long distance from restaurants has definitely made a difference in my motivation to cook. In Michigan if I didn't feel like cooking, we would just run to town and get some fast food. No sweat! With a 30 minute drive to Homer (more in the winter) and few restaurants that are open evenings, it is simpler and less time consuming to pull a steak out of the freezer and pop it on the grill. Actually, I have learned to think at least a day or two ahead, keeping a running menu in my head so I can thaw the appropriate vegetable or meat. I have thaw times down to a science, so I know exactly when to take something out of the freezer to have it thawed by time I'm ready to cook it. Meals are planned around my schedule, so if I'm not going to be home till late, dinner may be brisket, stroganoff, a roast, or stew in the crockpot. Days that I am home I can cook something that requires more prep time. Leftovers are coveted as we all negotiate who gets what for their lunches the next day. Two attitudes had to change in order to overcome my dislike of cooking. The first attitude was my abhorrence for dirty dishes. I joke about when my husband and I were first out of college and we would go for 2 weeks without washing dishes (just wash enough to eat). We finally hired someone for $5/hour to come in and wash, dry and put away our dishes once a week, because by golly, I wasn't going to be one of those wimpy women who does all the cleaning and cooking. I no longer hoard my dishes, not wanting to dirty them. It makes cooking so much easier if I actually use what's there! Now we've got kids old enough to load and unload the dishwasher, and we've come to a fairly comfortable medium of who washes/cleans up. The other attitude that had to change was this: I have always seen cooking as a subservient thing--a lower status--in the home. I've gotten over my control issues, image issues and low value issues, so cooking is now something I can truly enjoy--without the negative connotations. Now I can say, "I like to cook," and be proud of it rather than embarrassed at what someone might think. Of course, all the other factors above led to this. We're forced, in a way, to cook, so it was either change my attitude or be unhappy. Changing my attitude was easier than being unhappy in this case. As I often say, not everyone in Alaska has the same experience I have had. Not everyone that moves up here becomes a good cook--or even cooks that much. But the special chemistry that has worked between me and Alaska has given me a new hobby that fills me with pleasure as I cook, eat, and feed my family well. It has become a labor of love. And my greatest joy of all is seeing my kids interested in cooking: trying experiments with food, making up recipes, tasting different spices, and sharing time in the kitchen as a family. What an awesome gift to give them: the love of preparing food. When my aunt and uncle moved to Alaska 40 years ago they started a tradition of having an ice skating party every year that the ice froze smoothly enough to skate. This year conditions were perfect when the ice froze, creating deep, smooth ice, and today was the day of the skating party. It was snowing heavily when we left home, and the wind was blowing the snow horizontally. I was sure skating would be canceled in such weather, but to my surprise Delores said the weather was fine in Ninilchik--no rain, no snow--so we decided to make the 1 1/2 hour drive to join the skating party tradition. We went from snow at home to rain in Homer and back to snow as we headed up the hill out of Homer, then back to rain again until we hit Anchor Point when all precipitation stopped and the roads were dry (whew!). The lake is 6 miles out of Ninilchik down Oil Well Road and then some bumpy dirt roads (unmaintained, so luckily not too much snow yet!). Delores & John used a piece of plywood held in front of the 4-wheeler and made 8 swipes around the lake on Wednesday to clear the track you see in the picture. It is a .4 mile loop around the lake, and the kids and I skated for 3 hours today, so I wonder how many miles we went!! Actually we could (and did!) skate anywhere on the l ake because the snow wasn't very deep, and it was fun to "make tracks" in the fresh snow. We had a fire going and a spread of food, including the Alaska standbys of moose dogs (as in "hot dogs") and salmon dips and salads. It was a breezy day, but not so cold that we were uncomfortable. I wasn't sure how we'd hold up being on an exposed lake all day, but what with the exercise of skating and occasional hot drinks, we were toasty all afternoon. The kids were in skating heaven for 3 hours, playing tag, shoveling paths in the snow, eating desserts and basically hanging out on skates. I've skated ponds before, but never a whole lake, so this was a real treat. I will admit, I am sore, though I'm just itching to get back on skates and go some more! As a side note, my kids were out with friends on Beluga Lake in Homer this past week and they tried an experiment (the dad--not the kids!). There were large air bubbles near the surface in the ice and Don poked a hole in the ice to the air bubble and quickly put a lighter to the hole. Each time a flame shot up, sometimes as high as 3 feet! Apparently the rotting vegetation in Beluga Lake gives off methane, which gets trapped in air bubbles when the water freezes. Thus the spectacular side-show! I want to get down there and try it one of these days. If I do I will treat you to a picture of this on my blog! Well, it's a beautiful Saturday in November, and we're spending half a day hauling supplies out to Razdolna. Since our little Russian school is down 5 1/2 miles of gravel roads, the Kenai Peninsula School District which it is part of will not send it's delivery truck to school. All water, paper, shelves and other supplies are dropped off in the shed at McNeil Canyon School every Tuesday and Douglas (as well as the principal's of the other 2 Russian Schools at the Head of the Bay) has to pick up the supplies there and drive them to school themselves. Normally it just means a quick stop at the shed to load up our Durango, but sometimes when there are big items like the whiteboard, soccer goals and filing cabinet that needed hauling this weekend, we hook up our trailer and do the hauling ourselves. From where we live we drive 7 miles to McNeil, load up, tie down, cover the stuff with tarps if the weather's wet, and then head 12 miles back up the road to Raz. At times we have to slow to a crawl because Basargin Road is still a bumpy mess from frost heaves last spring. As I write this, Douglas is drilling holes in the walls, hanging whiteboards that were ordered in August and have finally come in. After years of trying to figure out a way to get high speed internet access out here, as well as Douglas' annoying persistence, the district tech folks finally made it happen. The school got high speed internet access in May a few days before school got out so I can actually blog from school. As you can see, the school is in need of a paint job. It is owned by members of the community of Razdolna and the school district leases it from them. An outside paint job was in the plans, but the inside of the school was completely rearranged and painted (by staff and student volunteers), and then new playground took priority. Over the summer a new playground was installed, almost completely at the expense of the villagers (the borough donated the play structure itself). It has become a new hub of the community as kids flock to the schoolyard to play. The great challenge now is that the village needs a new school. The building you see above has a capacity of 50 people, and with 48 students enrolled this year, they are pushing the ticket. The village is growing and enrollment is expected to hit 76 in 3 years as families with young children begin to send them to school. However, the district will not build a new school; the villagers have to come up with the money themselves. A modest 3000 sq. ft. building would cost $600,000. With 26 families in the village who have to foot the bill, that seems like an insurmountable task (can you imagine someone asking you to foot the bill to build a new school building--on top of your own mortgage??!!). The villagers have been running fundraisers, selling Russian food and bake sales, but that is a drop in the bucket compared to what is needed. The architect fees alone to come up with a plan for the school (which is needed before they can get a loan) were $42,000! Perspective. So while it is annoying to have to haul our own supplies to school and install them, it is such a small challenge compared to what the Russian's face in building a new school. It gives us a good feeling to know that these students are getting a good education, learning to read and write and do the things they will need to in order to make a good living for themselves. We had a couple of weeks of snowy and icy roads at the beginning of October, leading to a flurry of activity as people got their studs put on. "Got your studs on?" was a common question as I ran into people I knew. And as I drive around town I see tires in backseats of cars and in the back of pickup trucks. Studs? I thought that was a bit much before I lived in Alaska, but as you can see from the picture, they're just small metal nibs that stick out from the tires to give a little bit better grip on the road. I can see why they wouldn't want studs on roads in, say, the Midwest. With millions of cars traveling the roads, highways would be ripped up that much more quickly. But up here, with only 675,000 people in the whole state, and far fewer cars on any particular road, studs help keep people on the road, especially when a tow truck could take a long, long time to get there in rural areas. Many people just purchase an entire extra set of tires for their vehicle with the studs already on them. They come either with the rims or without rims. With the rims means that anyone can quickly switch over to the new set of tires--pop off the tires like you're changing a tire and put the new one on. Without rims means you end up taking your car into a tire shop and they charge $15/tire to switch them over which is what we do. Some people may actually screw in the studs themselves and take them off again, using the same tire year round, but I don't know anyone who does this. So when we ask, "Got your studs on?" it doesn't mean we actually put the studs on, it just refers to whether the tires have been switched over. The car is just a tad bit noiser driving with studs....kind of a clickety-clack sound. But it is well worth the security of better purchase on the roads--especially our very curvy, hilly East End Road out of Homer! Early this week we got a call from a neighbor across the canyon. "A grizzly bear is hanging around our house. Make sure you kids get a ride up to the bus." Douglas always drives them up, so that was no problem, but it shook us out of our complacency. We've known there have been bear hanging out all summer, as some of our neighbors have prowled about with their guns looking for it. However, we'd assumed it was a black bear since we ran into one nearby in early summer. Black bears don't bother us as much as "brownies" or "grizzlies". Just the afternoon before this call our kids were picking crowberries in the canyon. We know canyons are favorite places for bears--both to hang out and to hibernate. But we hadn't heard about one in the area for a few months, so I gave the kids the ok to go exploring. They'd come dashing back into the house for bags to pick crowberries in a big patch they found on the canyon wall, and headed right back out. Luckily Denver has a loud voice, so we all feel somewhat safer when he is with us warning the wildlife of our presence. But the bear alert in the morning, along with some of our trash scattered about put us on high alert. We purchased a bear-proof trash can, we've taken to carrying our .44 when we go for walks and the kids haven't had the desire to go exploring lately despite beautiful sunshiny weather. We're counting down till the bears go into hibernation, which is any time now. Since the snow we had earlier in Octber is gone, it has just been cold. When bears go into hibernation varies depending on a number of factors, including food supply, elevation, temperature, whether it has cubs, and amount of snow covering their food supply. We'd gotten complacent about wildlife alertness, so this has raised it in our consciousness. It doesn't feel that "wild" up here in Alaska now that we're used to it. This is a good reminder to stay alert and aware. Everyone has something different that they like to do in places they live and visit. For us, the parks and hiking trails are one, and trying new restaurants is another. I thought I would share our favorite restaurants we have discovered in Alaska to date. If anyone has a good one to share, please let us know so we can try it out as we travel! Cosmic Kitchen in Homer: You know a restaurant is good if it actually has 2 of them in a town the size of Homer! One is in the main part of town, while the other is out on the Spit. The smoothies are the best: they fill up a big cup with real fruit (not the imitation flavoring) and blend it up. Yum! The nachos are great, the burgers are delicious, and the only thing we have found that we don't like are some of their soups (they turn some things into soup that I wouldn't expect to be soup!). Overall, they are a good standby that we can always count on getting a good meal at. Blackwater Bend between Homer and Anchor Point: I know, they're a coffee shop, not a restaurant, but I can't resist mentioning them. They're in the middle of nowhere (actually, across the road from Norman Lowell's studio & art gallery), but they nearly always have a line of cars at their drive-up window, which signals to me that they must be good! I tried a coffee smoothie there and it was divine! They have gigantic cinnamon rolls, and a nice selection of other on-the-go foods. Hash Browns in Anchor Point: No restaurant is perfect, but I sure appreciate when they own up to their mistakes. When we went here a few weeks ago the waitress accidentally wrote down the wrong order for the kids. When I pointed it out to her, she didn't question it, she just took it right off the bill. It seems like most of the time if a restaurant makes a mistake you have to fight them to do anything about it, and it is more stress than it is worth. Hash Browns earned my loyalty by not making me fight. The pace of service is small town slow, so it is best to have plenty of time when you go. The Crossings in Soldotna: This restaurant has the look of class, so I was not sure we would be welcomed when we wandered in one Saturday after a morning of berry picking, stains on our knees and twigs in our hair. When I asked the hostess about our attire, she just said meaningfully, "This is Alaska," so I guess dress is not an issue. This is a classy restaurant. It overlooks the Kenai River, has multiple levels, lots of windows, conservative and trained waitstaff, pleasant music, and good food. It was a gem to discover. We've spent $60 on plenty of meals in Alaska, but usually it was at a hole-in-the-wall with terrible service and bad food. We left The Crossings fully satisfied with our dining experience and happy to pay the restaurant for it. I am looking forward to an excuse to go there again when we're in town! Alcapalco in Kenai: Again and again, the Alcapalco Mexican Restaurant is mentioned as a good place to eat at in Kenai when we ask people for a good restaurant. It has an extensive menu, and the two times I have been there the service was excellent--really outstanding. The food is good and the prices in line with what you are getting. It's nothing razzy dazzy, just a great place to go out for lunch with a group. Oh, and we really like their salsa. It will now be a regular stop for us when we are in Kenai to take some salsa to go. There is an awesome Oriental buffet in Anchorage, and a great steakhouse/pub in Skagway, but I can't recall the names...I'll have to track them down. The most fascinating thing about eating out in Alaska is the lack of chain restaurants. It is refreshing! Back in Gaylord, Michigan, I think the town was down to maybe 5 non-chain restaurants. It was hard to find a place to eat that actually had unique food. In Alaska the pendulum is far off in the other direction (at least in the non-metropolitan areas), with chain restaurants few and far between. I believe McDonald's is the only chain restaurant in Homer, out of something like 30 restaurants (in the summer). So we lose the consistency, but we gain when we find gems of culinary delight in out-of-the-way places. It takes much patience and trial and error to find good places to eat out. These are our favorites to date. Hope you enjoy them if you're in the area! Sunday morning we woke up to a white world. Six inches of snow had collected overnight, transforming our green and brown world to black and white. The local pond (above) had a thin sheen of ice on it, and the ground was almost completely frozen. Just one week ago I cleaned out my garden: dug my veggies and pulled everything up. This was the day I was going to rent a rototiller and till in my compost. Looks like I missed the moment, and it's not going to happen till spring. So Sunday was a play day, with the kids and I cross country skiing all over the local pastures, exploring the world from a different perspective! Snow forts went up, snowball fights ensued, hot cocoa was consumed and it was a joyous day. I fully expected the snow to all melt, as it was a sunny day, but it only melted a tiny bit, and snow has continued to drift down each day since adding to the base. It occurred to me that snow usually "sticks" till May 15 up here, so if this snow "sticks," that will be over 7 months of snow! Any takers??!! Or you can live in Homer where there's no snow (yet)!! Friday our neighbors called and said they were butchering their cows, and did we want to come and watch or help? I was actually pretty excited to see the process, so Saturday was set aside to discover what it is like to butcher a cow...to see firsthand how food goes from a living animal to a steak on our plate. Note: These are not the typical beautiful Alaskan pictures I post on my blog. However, if this blog is about "Life in Alaska", I don't feel quite right editing out the "rougher" or "baser" parts of life up here. People everywhere butcher cows (and goats, pigs, chickens, etc. ), but for our family, it is not something we encountered or experienced in our lives up until now, so that makes it part of our "Alaskan" experience. My 10-year-old daughter used 2 words to describe this process: "interesting" and "boring". I agree. I hope you enjoy, or at the very least appreciate, this photojournal of the process. 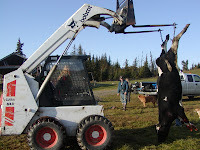 Our neighbors are hunters, so it was a simple thing to choose the gun and bring it down to the cow pasture. Compared to being mauled and eaten by a wild animal, being shot is an easy way to go. The cows didn't know they were about to be killed, and even after a couple had been killed, skinned and gutted, the others just stood around watching. The was no sense of agitation at all. This is part of what surprised me about this process. Even chickens (which I have butchered myself) get more upset than these cows did. Bleeding an anima l needs to happen fairly quickly, so the moment the cow is down (one shot between the eyes), someone cuts the artery below the heart. It takes a few minutes for the reflexes to stop so that the cow stops kicking. I've seen this same reflex at work on moose that have been hit by a car. Once the cow has been bled, it is hung. In this case, our neighbors have a Cat with a forklift, which is very convenient. If this were a moose out in the woods the process would be a lot messier. The cow is brought to a good spot and laid on its back, propped up between a couple of logs to keep it steady. Skinning the cow was th e part I was dreading the most, I think, but I was amazed at how clean it was. The only blood is what might have gotten on the cow when it was bled. Other than that, it seems the blood is contained and so it is not a gory process at all. Really, sterile is the word that comes to mind. The skinning is routine work, and fairly simple. There were 4 of us "newbies" there to observe and help how we could, and we all felt pretty competent by time we were done. After the legs are skinned they are sawed off mid-leg, and after the belly has been sliced open, the sternum is sawed as well. This entire pro cess, from shot to the end when the cow is quartered and hung took less than an hour. Normally it takes them less time when they don't have inexperienced people helping. They take their cows to a processor so that they get good cuts, sausage, stew meat, etc. made up. Apparently the meat can hang for 10 days in cool weather before it begins to go bad. The heart is the only internal organ that they keep, and they give the tongues to someone who enjoys cooking them up. For people who have been raised in hunting families or on farms, this is probably all old hat. I was not, so this was a new experience for me. I don't think I would go and start raising myself a cow and butchering it myself, but the whole concept of growing your own food--meat--is not quite so foreign to me anymore. The carbon footprint for these cows is very low. They are raised on the farm over winter, fed grass, butchered here and driven a few miles down the road to the processor. Part of the problem with typical meat bought in the stores today is that it takes an immense amount of energy to grow, butcher, process and ship to stores all over the country or world. The carbon footprint is large, and much of the nutritional value of the meat is lost due to being corn-fed animals. It is neat to see how it "should" be done, or at least seeing that some people still have the skill, equipment and know-how to actually feed themselves. I read a newspaper clipping recently about mountain bike trails in the Homer area, and they rated the Caribou Lake Trail as a 2 out of 5 (pretty easy!). This trail takes off of Basargain Road near the Village of Razdolna, so we have passed it many times, but never took the time to check it out. A couple weeks ago we decided that it was time to do it, so penciled it in for today. It is a 4-wheeler highway in the summer, and a snowmobile freeway in the winter. Since we didn't think the kids would be up for a 14 mile mountain bike ride, we decided to 4-wheel it. Good thing we did. We wouldn't have gotten very far biking! Well packed, nice dirt trail. If it weren't for all this rain, the trail would have been mostly #3 and a joy to hike, mountain bike or 4-wheel. As it was, the mud was up to a foot deep in most places that wasn't boardwalk. The kids were a little nervous, and though I was mostly (!!) confident in the 4-wheeler's ability to get me through the muck, it took complete concentration and some muscling to keep the machine on the trail. I would say the boardwalk was maybe 2-3 (??) miles of the 7. The nice, packed trail might have hit 1 mile in some high, well-drained spots. The remaining 3-4 miles was muck! Since we've moved here we've seen probably hundreds of ATV's being hauled down East End Road to the Caribou Lakes Trail. I have noticed that all of them that are heading back in the direction of Homer have been very muddy! Now we know why. Here's a picture of me after our excursion today. The picture doesn't do justice to how muddy it was! As for Caribou Lake, we were utterly unimpressed. People talk about it like it is a really incredible place, but it's a medium-sized lake with lily pads growing on one end and a virtual village of cabins surrounding it. The irony is that people go there to "get away", but they are surrounded by neighbors out there! Some of the "cabins" are nicer than many people's homes; other cabins have been in the family for generations so there is a sense of history with it. It took us a little over an hour to 4-wheel 11 or so miles from our house to Caribou Lake. I will admit that we certainly felt like we were a long ways out--it was a long hour! I actually started to enjoy myself on the way back with the sun shining and despite my forearm cramping from keeping the gas lever pressed. I actually, in a perverse way, look forward to going out there again and exploring some other trails! Next time I'll wear muck boots so the waves of mud don't wash into my hiking boots! Although we still have more daylight than the Lower 48, I begin to notice the return of darkness. We now have to turn our nightlights on, as it actually gets dark at night again. And last night I saw stars for the first time in months. I may have been able to see stars before now, but it has been such a cloudy, rainy summer that I haven't seen any. Plus, I'm usually asleep in the middle of the night when I might be able to see them! Part of me is happy that there's not quite so much daylight--a more normal amount! Another part of me is sad because the return of darkness at night signals fall, going back to school and the impending "season of darkness". So it was with mixed emotions that I gazed at the stars last night. Back in May I happened upon Bishop's Beach at a -5.5 tide, and said I was going to put the August low tides on my calendar (we were out of town for the June and July minus tides). Our entire weekend revolved around low tide activities, as we had a -4.1 for clamming in Ninilchik Friday, a -4.4 for tidepool exploring Saturday and a -3.4 Sunday for a 7 mile beach hike from Diamond Creek to Bishop's Beach. Clamming is great fun, and a way to get very dirty! A party of 7 of us (4 shovels) dug 2 1/2 three gallon buckets of them in one hour. Denver and Aurora each got a few clams all by themselves (dig and grab), but mostly I dug and the kids grabbed. My goal for the day was to not break so many (they're a lot harder to clean), and my first 5 or 6 I broke when I grabbed them, but then I refined my digging and grabbing techniques and pulled out my clams unscathed. Most were 6-10 inches long, and the 3-5 inch ones we put back in the holes. Our regular Alaska fishing license covers clamming, and we're allowed 60 per day. Clam Gulch, once known for their clams, has been overharvested and you can't find more than 3-4 inch clams there anymore from what I hear. I t is the cleaning afterwards that is not fun! It took me three hours to clean my one bucket of clams, with Denver cutting off the necks and cutting them open, and Aurora helping gut them for awhile. All the while we dreamed of clam chowder to keep us going through the tedious process. Tidepool searching the kelp beds during a very low tide on Bishop's Beach is like a treasure hunt. We saw a small jellyfish, shrimp, a couple live crabs in shells, many dead crabs not in shells, anemones, sea cucumbers, clam breathers, starfish of many sizes and jellies, among many other things that we didn't know the names of. The kids found it as cool as I did. The tide only gets low enough to expose those areas a handful of times a year, and from here on out I will adjust my schedule to try to be in Homer to visit the beaches during those low, low tides. Seeing a jellyfish and walking along with it as the tide brought it in. It was very cool seeing it pulse, and I never pictured them as being translucent blue. Denver picked up a shell to take home, and 30 minutes later as we were heading back up to our car, a crab started coming out of it. Denver screamed and dropped it in the water, and it scuttled away. Seeing a flounder (a flat fish like a halibut); it was nearly impossible to pick it out when it was still since it blended in so well. We have been wanting to hike from Diamond Creek to Bishop's Beach for a year now, ever since we found out we could. We used a low tide as an excuse to schedule it in so that we would have firm sand to walk on (hopefully; we weren't sure what the beach would be like!). Although it was only a -3.4, a whole foot less than the previous day, we ended up seeing a great number a very cool tidepool creatures and plants. Most of the hike was bordered by cliffs like these. It was easy walking on firm sand most of the way, especially for the kids and I with our muck boots. Doug has held off getting muck boots, and by trail's end his hiking boots were soaked. The Sterling Highway gets as close as 40 feet from the edge of this cliff, and with global warming and higher sea levels, this cliff is being washed away. I have heard that in 25 years or so sections of the Sterling Highway will be washed into the ocean if current trends continue. That could definitely change the dynamics of getting to Homer! Slime molds were the highlight of this hike, as seen in the picture to the left. We've seen 2 or 3 slime molds in all our beach walks in a year, and today we saw at least a dozen. They are fascinating in the patterns and colors displayed. This one has obviously been out of the water for awhile as the edges are rough rather than smooth and regular. The rock pictured to the right was amazing. It looked more like driftwood or I don't know what--but not a rock! The only blip in our hike was at about mile 5 when I got stuck in some mud. We'd been going along on firm sand and pebbly rocks, but decided to cut across a little cove. I was following Aurora, who got sucked in a little, but when I followed my boots got completely mired and I had to take them off in order to pull them out. Meanwhile, the mud had overflowed into one boot, so I had a mucky mess. I decided to take both of them off and walked out of there barefoot. It was warm enough and all firm sand from there on out, so I just walked barefoot for another mile or so until my feet started getting rubbed raw. A dead sting ray was the most fascinating and unexpected find of the day. Once again Denver had picked up shells to take home, and this time the crab didn't start coming out till we were in the car! Oh no! Denver panicked, and it was hilarious watching his expression as he held a shell with a crab crawling out of it! If he dropped it, it would fall in his lap, and he certainly didn't want that!! I relieved him of it, and he carefully checked all his other shells for hidden invaders! Who would have guessed what fun low tides could bring??! !